Deputy President William Ruto has warned sports administrators that they will be held accountable for their actions, including doping. “Everyone will be held to account. They must deliver and keep the straight and narrow. Those who step out of line will face decisive action. They must up their game,” he warned. Ruto said it was not beyond Africa to host the Olympic Games in the near future. “This can happen in our lifetime, say in the next 10 years. Kenya, being a great sporting nation, could be the first destination,” he said. The Deputy President said preparations for the 2017 Africa Youth Championships 2017 to be held in Nairobi were on course and the country will be ready to host the world. 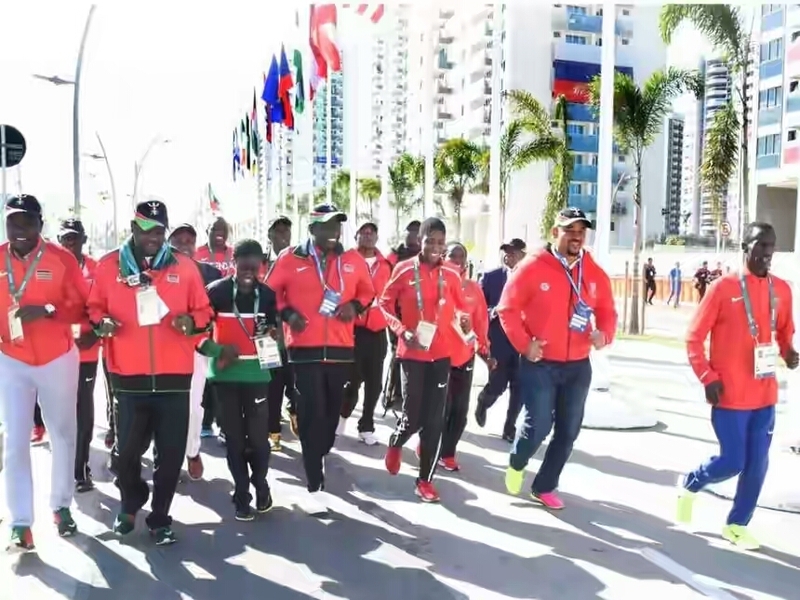 The Deputy President William Ruto was speaking when he joined Team Kenya athletes for a jog and breakfast over the weekend in Rio de Janeiro, Brazil. Ruto, who visited Team Kenya at the Olympic Village, took time to encourage each athlete. With an arm around their shoulders, he engaged each competitor, at times breaking into jokes and laughter. Ruto cut a fatherly figure as he smiled and imparted wisdom. Ruto was taken round the facilities at the camp by team captain Ezekiel Kemboi and was impressed with what he saw. He said he us confident of a sterling performance. “You make us proud. You are our ambassadors. The President has sent me to wish you good luck so that we can conquer the world,” the Deputy President said. Ruto told the athletes that Kenyans had faith in their abilities. “All of us know Kenyans are judged by very high standards because of your prowess, standing and outstanding performance. “There can never be Olympics without you. It will be ‘half Olympics’ without Team Kenya. You have demonstrated that you are a force in matters sports,” he said. Ruto promised the athletes that the government will ensure they are comfortable during their stay in Rio de Janeiro so that they can concentrate on their art. “We being here is a statement of our support and if you have any issues, we will sort them out. This is an important national duty and you are running for 40 million Kenyans,” he said. The Deputy President noted that 251 athletes had qualified for field and track events, but only 48 were in Rio de Janeiro. He termed this as a testament of the rich resources at the country’s disposal. “To get here is not easy. You had to overcome hurdles and your hardwork and determination paid off. our great ambassadors,” he said. Kemboi said his compatriots were raring to go and will make the country proud. “We are happy with what the Government has done. We hope what we have requested will be fulfilled,” said Kemboi. Ruto said the Government had set aside Sh1billon for athletes representing the country in international sporting events. He said this in appreciation and recognition of the “profile” they give Kenya. “In the past, as a country, we didn’t recognise our athletes, the profile and positive image they give us globally,” Ruto said. He said the government appreciated the many hours the athletes put in their preparations for major events, and in future their toil will not go unnoticed. “For every athletes’ sweat, every run and whatever else they do, the government is thinking about them. We share in their toil and the few minutes we see them on the track is backed by many hours, days, weeks and months of preparations,” said Ruto. The Deputy President announced that every athlete will receive Sh150,000 for their participation in the Olympics. “They are in high spirits and have promised to fly the Kenyan flag high in Rio. Yesterday, we saw signs in the 10,000 women’s final in which we won sliver,” he said. Ruto congratulated the athletes for furthering the government’s aim of being a doping-free country. He said they had undergone many tests successfully. “This has firmed the belief that we believe in clean sports,” he said. National Olympic Committee of Kenya (NOCK) president Kipchoge Keino said morale was high in the camp, the team was united and ready to win medals.